Born in Puerto Rico next to a rainforest, Hector Garcia, a Senior R&D Engineer now lives and works in the not-so-tropical climate of Ann Arbor, Michigan. A computer science and engineering PhD, Hector lectures on the topic at his alma mater and practices what he preaches. He’s a seasoned engineer with past positions at Ford and Amazon and joined Criteo upon learning about Criteo’s machine learning talent. We chatted with Hector about his background, path to Criteo, and how he balances teaching with the demands of his position at Criteo. I grew up on the eastern side of Puerto Rico in Luquillo, which is a lovely beach town that sits right next to El Yunque rainforest. I went to undergrad at University of Puerto Rico and, after jumping around programs, ended up with a Bachelor’s from the business school and a concentration on information systems. In 2003, I moved to Michigan for a job opportunity with Ford Motor Company. I’ve always been interested in computers since I first interacted with them in elementary school. Another passion of mine is Physics, which is where I started as an undergrad. I had an opportunity to combine those two passions when I eventually did my PhD in Quantum Circuit Simulation at the University of Michigan. My research area experienced a prolonged lull at the time I graduated so I decided to continue down the path of big-data systems engineering, which is actually not too far from the practical aspects of my PhD research. Since then, I’ve held software engineering positions at several companies including Amazon, TD Ameritrade and now Criteo. I have a faculty position at the University of Michigan, which keeps me involved with the academic community. How did you join Criteo and balance your faculty position at the University of Michigan? I first heard of Criteo during the Hooklogic acquisition but did not look for opportunities until several of my former colleagues from Amazon got involved – they all praised the technical challenges and work environment so I eventually decided to come in for an interview. Teaching, and being part of the academic community, is something that I really enjoy and actually miss during periods when I don’t get to do it. The trick to balancing the two is finding synergies between what we do at Criteo and what the academic community is involved in, which is not too hard since Criteo has strong technical talent in machine learning. One example is our push to bring the Criteo NABD conference to Ann Arbor with a strong presence from University of Michigan. There are a lot interesting research and industry talks that we are planning so watch out for that! When I started a year ago, I joined the CBS data modeling team working on what is known as attribution, which is the identification of a set of user actions that contribute to online and offline brand sales. There are very interesting challenges in that area so I very much enjoyed the work. More recently, I’ve been working with the CBS data pipeline team improving and adding new features to our client reporting services. What’s the goal of your position at Criteo? What’s the hardest thing about it? The main goal of the CBS data team is to engineer data applications for brand monetization. One of our primary tasks is to stream, process and aggregate data from all our partners. Since every partner does things differently, part of the challenge is to bring a consistent view to multiple sets of disparate data in an efficient and scalable way. Tell us a little about what makes the Ann Arbor office different. Ann Arbor is really an awesome place to live. My family and I first moved to the area intending to move after a few years. But we loved it so much we’ve decided to stay. Ann Arbor is interesting- it combines city and college-town living in a unique way. There is a vibrant tech community and, of course, it’s a great place to be if you like sports. It’s also close to big cities like Detroit, Chicago and Toronto. Local restaurants are so good they featured in a Hollywood movie called The Five Year Engagement. 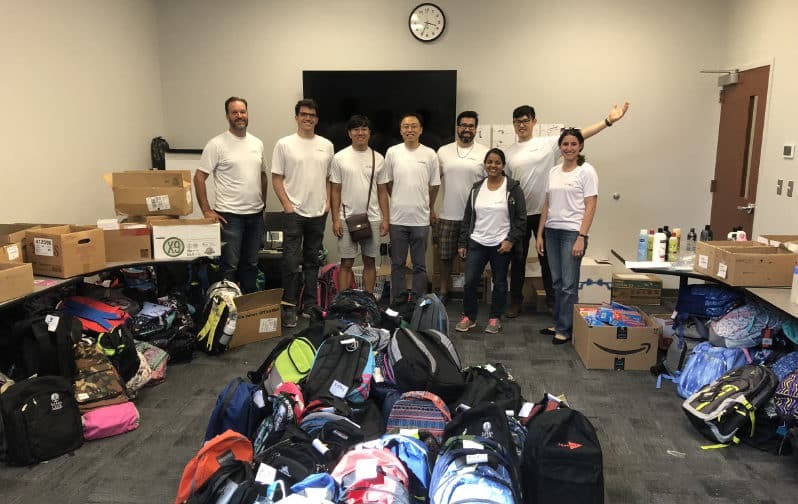 Hector, fourth from right, with fellow engineers volunteering at a Criteo Go Day, preparing backpacks for underprivileged youth. Criteo’s engineering culture is by far its greatest asset, in my opinion. Our organization’s mindset is that engineering excellence provides value to our customers and differentiates us from the competition. We recently completed the migration of several systems from AWS to Criteo infrastructure. It was a priority during the migration to take the time to re-vamp processes and introduce new technologies. In my experience, most companies don’t actually make technical debt a priority so I was incredibly pleased to see that, which I guess is an example of Criteo’s awesome engineering culture! Our teams and systems are stronger for it and we are now focusing on delivering better features faster. I really enjoy straddling the line between academia and industry so I look forward to continue developing our Criteo teams by strengthening partnerships with academics and the Ann Arbor tech community. Any advice for engineers? What is Criteo’s R&D Team looking for? In terms of technical skills, I think engineers sometimes overlook the importance of knowing and understanding the fundamental principles of Computer Science. My opinion is obviously biased since I lecture undergrads on these topics. However, when you look deeply at any breakthrough technology, there is always some well-known CS fundamental that drives it. In terms of so-called soft skills, I’m a great proponent of always having a learning mindset. I think it’s the one skill that rules them all in that a desire to learn makes you a better engineering, better leader and all-around better team player. Thank you Hector! Criteo Ann Arbor is hiring! Learn more about Criteo Culture here.